The grand prize winner is ‘Face to face in a river in Borneo’, an image of an orangutan crossing a river in Indonesia’s Tanjung Puting National Park. The photo, chosen from 11,000 entries, was captured by Jayaprakash Joghee Bojan of Singapore. He has won $10,000 and will have his image published in an upcoming issue of National Geographic magazine and featured on the @NatGeo Instagram account. Photographer Bojan took the photo after waiting patiently in the Sekoyner River in Tanjung Puting National Park in Borneo, Indonesia. After spending several days on a houseboat photographing orangutans in the park, Bojan found out about a location where a male orangutan had crossed the river –­ unusual behaviour that he knew he had to capture. After waiting a day and night, a ranger spotted the orangutan the next morning a few minutes up the river. As they drew near, Bojan decided to get into the water so the boat did not scare the primate. 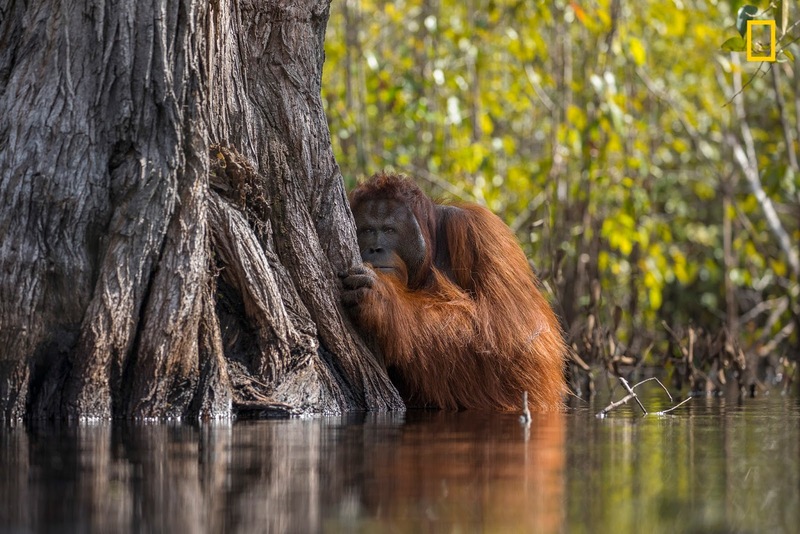 About five feet deep in a river supposedly home to freshwater crocodiles, Bojan captured the photo when the orangutan peeked out from behind a tree to see if the photographer was still there. Karim Iliya won first place in the Landscapes category for a photo from Hawai’i Volcanoes National Park; Jim Obester won first place in the Underwater category for a photo of an anemone and Todd Kennedy won first place in the Aerials category for a photo of a rock pool in Sydney at high tide.